Once upon a time cultural appropriation was something theorised and discussed solely at universities. Now, due to our globalized, interconnected, social media fuelled world, the use (or in this case, misuse) of another’s cultural property can turn into big news. When you have the likes of Pharrell Williams being slammed for wearing Native American headwear or Selfridge’s being accused of appropriating black culture, you know that cultural appropriation is no longer something that engages only academics and students. In fact, the topic of cultural appropriation now touches many areas of our lives from political discourse to marketing to international business to the arts and beyond. Debates rage on the internet over its validity, meaning, applications and implications. Much of the debate and disagreements over cultural appropriation stem from misunderstandings over the real meaning of the term and how it should be applied. Many of cultural appropriation’s critics state that is not wrong to use or adopt things from other cultures. At the other end of the spectrum, some are overly protective of others’ cultures believing one cannot use anything from another culture as it would be ethically wrong. Both ends of the spectrum skew the true meaning of the cultural appropriation. Advocates do not state that one should not be inspired by, use or implement things from other cultures; nor do they believe cultures should be anything other than sharing with others. Sharing your culture is fine – in fact, it’s extremely positive. Where cultural appropriation goes wrong is in how it adopts and uses something from another culture and especially, why? Essentially, it comes down to whether the culture being is being ‘used’ as well as possibly being ‘abused’ in the sense of having their culture’s story being told by a more powerful, usurping other. Probably the best way of understanding cultural appropriation is to look at some examples that have made the news. The fashion world especially seems to have a knack for causing commotion when it comes to badly borrowing from different cultures. Nike caused so much anger when they ‘borrowed’ some Samoan tattoo designs for their Pro Tattoo Tech collection that it actually led to a petition calling on the company to stop sales. More recently the high street fashion retailer, Top Shop, caused consternation for using the Palestinian black & white scarf design for a summer dress. Associated with the struggle for independence from Israeli occupation, Twitter users soon rounded on the company to point out the error of their ways. “I hope Topshop chokes for their culture appropriation, it’s not a monochrome print, it’s a keffiyeh w/ a history of hardship and bloodshed.” The company withdrew the item. French fashion brand Chanel was lambasted by Aboriginal groups and social media users for selling a $1000+ Chanel branded boomerang as part of their spring-summer 2017 collection. "The boomerang is a piece of Australian Aboriginal culture. No other place has it," wrote Instagram user @amberjfaull. "This is the most blatant cultural appropriation." These are but a few examples of cultural appropriation. What is common to them all is that in each case, a minority culture is essentially being commercially exploited. This is what cultural appropriation is against. Using an item of clothing from another culture, a design or pattern, a turn of phrase or a symbol is not always wrong. If anything, exposing people to different cultures is a great thing for developing understanding and empathy with and for others. When adopting from a foreign culture it is crucial to follow some basic steps that will help you avoid being accused of cultural appropriation and instead help create cultural awareness. Prior to using another culture’s intellectual property, it pays to properly research and understand it. Taking without respect, knowledge or insight will ultimately lead to a serious backlash and accusations of cultural theft and cultural misrepresentation. Berlin-based HOLI Festival of Colours found itself under fire last year for organising a "Holi festival" (in the party sense) in London. The event was based on the Hindu festival of Holi. This festival however was not meant for Hindus but rather youngsters happy to pay £30-£50 to dance to beats and throw paint at one another. “.. in terms of representation and who’s telling this story of Holi, how it’s being told and why, it’s troublesome, and arguably a textbook case of cultural appropriation,” says journalist Rahul Verma. Ask any practicing Rastafarian what they think about cultural appropriation and you will soon understand the viewpoint of a minority culture in terms of their beliefs being commercialized. In the UK, a burger bar by the name of Boom Burger drew criticism for exploiting Rasta culture and making it centre to their brand and image. Many noted that it was offensive that the chain obviously knew nothing of the religion, its practices or beliefs. For example, the chain was selling pork burgers – pork being considered unclean and not eaten by Rastafarians due to scripture. In the West, it can be easy to sometimes overlook the sacred. What might seem a bit of fun, a joke or an innocent mistake to some, may cause serious distress to others. Much of the world still holds some things sacred, whether that be God, gods, spirits, symbols or anything else. Using the sacred is a serious no-no unless you want to cause trouble. When fashion designer Cavalli decided to use a little known symbol held sacred by a little know Muslim Sufi order on one of his new perfume ads, little did he know the headache that was to ensue. A groundswell of protest began on social media and at fashion events attended by Cavalli when students from the Maktab Tarighat Oveyssi (MTO) Shahmaghsoudi School of Islamic Sufism, which has branches in several countries and estimates a membership of 500,000, realised he had pilfered the symbol. In the USA, the wearing of the Native American headdress has been receiving much attention over the past few years. It is not only Pharrell Williams who has fallen foul for sporting the headwear but Victoria’s Secret, Harry Styles and Gwen Stefani. Even the Glastonbury Festival in the UK banned sales of Native American headwear without prior approval. The Native American community have been resolute in their belief that using their headdress crosses the line. "The headdress is reserved for our revered elders who, through their selflessness and leadership, have earned the right to wear one. It’s a spiritual garb, not just cultural; it's not merely an addition to one's attire. Wearing one, even an imitation headdress, belittles what our elders have spent a lifetime to earn." Simon Moya-Smith. A big issue with adopting from other cultures is that it can be based on stereotypes, often negative and incorrect. It is natural when a foreigner peers into another culture for them to do so with their own cultural preconceptions and baggage. They cannot have an objective opinion nor an insider’s insights and therefore their understanding of the culture may be based on stereotypes. Halloween costumes have now become a very sensitive area within the cultural appropriation debate. This piece in The Independent concisely demonstrates some examples from the Halloween costume market and how they do nothing but compound outdated stereotypes of different cultures. Many of the costumes found on the market led to complaints and had to be withdrawn. One area in which many fail when it comes to borrowing from other cultures, is that more than often that culture is not represented in any shape or form in the decision-making process. There is a dire need for more diversity in businesses and organisations, whether media, marketing, fashion or art. Having people with knowledge of different cultures and who understand the psychology of minority cultures or faiths is a sure-fire way of avoiding many of the potential pitfalls. Diversity in newsrooms, or the lack of it, can also cited as a reason for cultural appropriation controversies in the media. The cultural homogeneity within media organisations only allows for one point of view and thus will always be caught in the trap of making mistakes and potentially undermining social cohesion. More diversity in the workplace means more can be done to stop the one-sided conversation. Perhaps the most effective way to avoid cultural appropriation is to engage with the culture you are adopting from. Spend time in it, understand it, engage with it and then when it comes to using a pattern, symbol, headdress or anything else make sure you use that platform to promote that culture, its people and if possible share benefits with them. The Atlantic points to the example of the 2015 Costume Institute exhibition, “China: Through the Looking Glass,” at New York’s Metropolitan Museum of Art, as cultural appropriation done the right way. Rather than impose their interpretations of what is 'Chinese', the organisers worked with Chinese counterparts to ensure everything was tasteful. On top of this many of the celebs who attended the event wore pieces from Chinese fashion designers, helping promote, rather than take from the culture. Quartz created this video below about a Brazilian sports company who appropriated from an indigenous tribal culture. Inspired by their designers the company gives the tribe royalties from their collection as a way of working with the tribe. Simply put, if you take from another culture without understanding, awareness, sharing and respect you open yourself up to accusations of cultural appropriation. If you engage with the culture, mingle, listen to their stories and create a relationship, the chances are you will not only do it right, but do both parties proud. 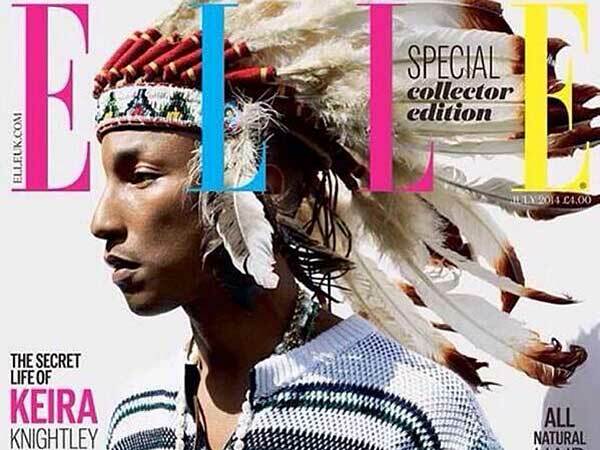 READ MORE: How Cultural Appropriation Could Soon Be Illegal from FashionUnited.